1) I've only made it once before... and that was several years ago. 2) It takes FOREVER since you have to cook the noodles AND the meat and then bake it. **I ended up with a really thick sauce so I had to add some water to it for the noodles to soak up. It worked out perfectly. Plenty to sauce was left after the noodles cooked. It's up to you how much water to use. 1. In a mixing bowl, combine egg, 1 1/2-2 cups of the mozzarella cheese, the cottage cheese, 1/4 cup of the parmesan cheese, and the parsley. Stir until well-blended. 2. Brown meat with garlic and onion. Drain grease and return to skillet. Stir in diced tomatoes, tomato sauce, tomato paste and water, mixing thoroughly. 3. Spread 1 cup of the sauce mixture into the bottom of a 9 x 13 baking dish. Top with a layer of three lasagna noodles, one-third of the cheese mixture, and 1 cup of the sauce. Repeat layers twice. 4. Top with remaining three lasagna noodles (if lasagna is getting too "tall" for your dish, press the lasagna noodles down to flatten it a little) and the rest of the sauce. 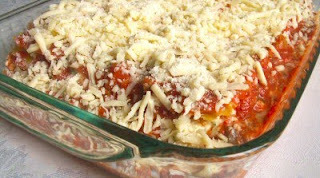 Sprinkle the remaining 1 1/2-2 cups of mozzarella cheese and the remaining 1/4 cup of parmesan cheese on top. Cover with greased foil. 5. Bake at 350 degrees for 45 minutes. Uncover dish and bake an additional 25 minutes, until top is browned and noodles are tender. Remove from oven and let stand for 10-15 minutes before serving. Hey you! I feel like i haven't been here in so long! How's your mom doing?